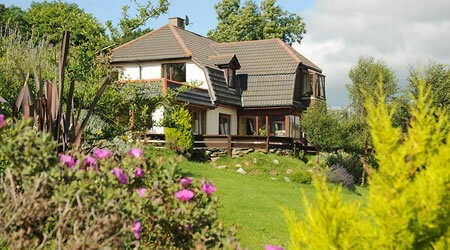 Lough Dan House is a cosy B&B, set in the beautiful Wicklow Mountains National Park. It is the perfect mountain hideaway, and an ideal spot for outdoor activities such as walking, fishing, horse-riding and much more. This magnificent landscape has inspired painters, poets and nature lovers for centuries. Lough Dan House is the perfect base to explore the mountains, experience the local culture or simply enjoy the peace and quiet of the countryside. It also offers a central location for the heritage enthusiast, with lots of garden exhibitions and historical attractions to explore. 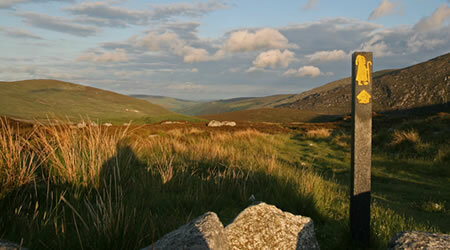 Wicklow Mountains National Park amounts to over 20,000 hectares of upland mountain scenery. Situated on the doorstep of Dublin the landscape is wild and beautiful. The Wicklow Mountains are famous for granite rock which runs in a line of peaks with expansive corries gouged out of the flanks of the higher summits. Special features of the area to the east of the spine are the glacial valleys, such as Glendalough, that penetrate from the mountain range. 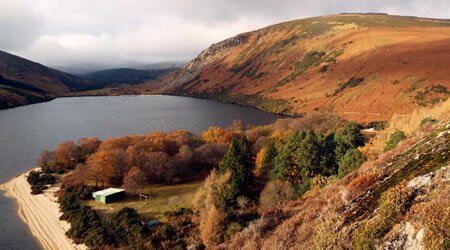 Lough Dan is the largest and least inhabited of these valleys and contains two lakes, spectacular waterfalls, steep corries, slow meandering rivers, white sandy beaches and remnants of primeval oak woodlands that once covered most of Ireland. Also to be found at Lough Dan are a number of village settlements which were decimated following the great famine which saw the population of Ireland reduced from eight million to a mere two million, 150 years ago. The entire area is protected as a Special Area of Conservation, a European designation. The “Wicklow Way” Ireland’s first long distance walking route (130 kilometres) is part of a network of long distance self-guided walking tracks throughout Ireland. It’s easily accessible with a wide variety of scenic experience, much of it in truly remote areas. The “Way” is the most westerly part of the E8 footpath which extends across much of Europe and overlooks the shores of Lough Dan, as it winds its way trough Wicklow from Marley Park in Dublin to Clonegal in Co. Carlow. The St Kevin’s Pilgrim Way runs some 50 kilometres from Hollywood in west Wicklow to Glendalough, the oldest ecclesiastical city in Europe, which was founded by St Kevin in the fifth century. It was used for over one thousand years by pilgrims from other parts of Ireland making their way to pray at this holy city. 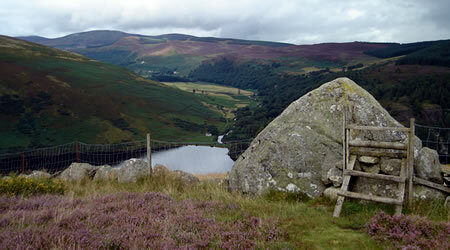 Glendalough is only 5 kilometres from Lough Dan House. Lough Dan House is accessible to 35 summits over 500 metres, 24 summits over 600 metres, 12 summits over 700 metres, 4 summits over 800 metres and Lugnaquillia, only thirty minutes away at 925 metres. There are also countless miles of moderate low-level hill walking and coastal areas, well away from tarred roads and traffic. With such variety of routes on the doorstep to choose from, and all your holiday requirements taken care of, “Lough Dan House” is a perfect location for any walking holiday.